Police seeking driver of 2007 Infiniti who fled scene of multi-car accident on foot. 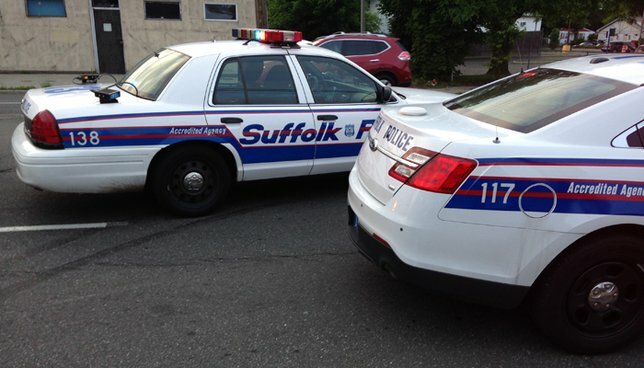 SCPD are investigating a hit-and-run crash involving five vehicles that seriously injured four people in Copiague on Sunday, April 2. Copiague, NY – April 3, 2017 – Suffolk County Police Major Case Unit detectives are investigating a hit-and-run crash involving five vehicles that seriously injured four people in Copiague on Sunday, April 2, 2017 at 8 p.m.
A 2008 BMW and a 2007 Infiniti were both traveling southbound on New Highway at a high rate of speed when the vehicles sideswiped each other at approximately 8 p.m. The BMW, being driven by Michael Plummer, went off the roadway and struck a fence. The Infiniti struck the rear of a 2004 Chevrolet Blazer that was traveling southbound on New Highway and caused the Chevrolet to overturn. The Infiniti then struck two parked vehicles in front of 475 New Highway. The driver of the Infiniti fled on foot. Plummer, 33, of North Amityville, was transported to Good Samaritan Hospital Medical Center in West Islip with serious injuries. The driver of the Chevrolet, Junior Joachim, 32, of North Amityville, was transported with serious injuries to Nassau University Medical Center in East Meadow. Joachim’s front seat passenger, Steve Clavin, 28, who was seriously injured and Joachim’s backseat passenger, Pierre Prophete, 23, who was critically injured were both transported to Good Samaritan Hospital Medical Center. The investigation is continuing. Detectives are asking anyone who witnessed the motor vehicle crash or stopped at the scene of the crash to call the Major Case Unit at 631-852-6553 or Crime Stoppers at 1-800-220-TIPS. So why do A lot more people Play Bingo Games? Subject: LongIsland.com - Your Name sent you Article details of "Four People Seriously Injured in Copiague Hit-and-Run Crash, According to SCPD"